I have endeavored to distinguish between what I take to be two opposing methods of appropriation: those bent, Bloom-like, on usurpation through imitative violence and those that pursue misreadings with greater reverence, aspiring to stand alongside or in the company of an antecedent rather than above him. Three Sons derives from Medin’s doctoral dissertation and it immediately begs the question: Of the many writers who demonstrate some literary paternity to Kafka, why Roth, Sebald, and Coetzee? Medin say he chose them because each had “revisited” Kafka over the course of thirty years or more, although his primary focus is a single work of fiction by each author: Roth’s Zuckerman Bound, Sebald’s Vertigo, and Coetzee’s Elizabeth Costello. But there is another commonality between these three sons; each has addressed Kafka not only through fiction but also through works of literary criticism, and Medin, himself a scholar and literary critic, spends a fair amount of time analyzing that aspect of their oeuvre. Sebald said that in his prose fiction he often “tipped his hat” to other writers like Kafka and Robert Walser, but Medin suggests that this is a misleading metaphor for an act that “belied the aggression inherent in his approach” to the writers he admired and used. In Vertigo, Medin asserts that Sebald “forcefully bent the voices of Kafka, Walser, Conrad, and others toward that of his narrator, divesting them of their original spirit to reinforce his own thematic emphases.” Sebald, of course, knew what he was doing – or at least to a large extent. In Vertigo, his use of the appellation “Dr. K.” rather than “Kafka” signaled his strategy of playing loose with Kafka’s life and texts. Medin’s extended essay shows, through careful analysis of Kafka’s diaries and texts (primarily The Castle, “The Hunter Gracchus,” and “The Country Doctor)” how “the pattern of misreading” that Sebald employed permitted him to reshape Kafka more to his own obsessions. By the end of Medin’s careful and detailed reading of Vertigo I felt as if I had been watching him carefully separate two thin layers that had at first appeared to be nearly identical, one representing the historical and textual record left behind by Franz Kafka and the other representing the Dr. K. that Sebald needed. By the end, Medin had made it clear just how much those two versions diverged. During the process of untangling Vertigo, Medin also builds a critique of Sebald’s literary criticism on the side. His summary judgment is severe; he takes Sebald to task for “critical manipulations…[that] mar his critical work” on Kafka and on other writers as well. Most of the essays in Describing Misfortune (Beschreibung des Unglücks) and Uncanny Homeland (Unheimliche Heimat) fall short of the scrupulous standards exemplified by Coetzee. They are too fictive to convince as research, and too fettered by convention to successfully execute the sort of autobiographical exegesis pursued in later volumes (Lodgings in a Country House, Campo Santo). By comparison, Medin expresses his admiration for Coetzee’s “critical reserve” and “interpretive restraint.” While Coetzee’s “less combative” stance toward Kafka seems to be Medin’s preference, I don’t think he is invoking a value judgment on Sebald or Roth for their approaches. His primary objective is to demonstrate that, contrary to Harold Bloom’s assertion, not every author-forerunner relationship needs to be murderously Oedipal. Daniel L. Medin. 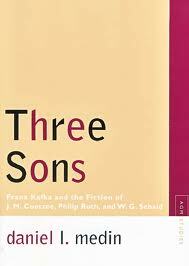 Three Sons: Franz Kafka and the Fiction of J.M. Coetzee, Philip Roth, and W.G. Sebald. Evanston: Northwestern University Press, 2010. Interesting combination of names: From Kafka to Cotzee. Will certainly follow this up. Just reading “Walter Benjamin” – who believed with BRECHT in KAFKA being the only and most advanced writer of his time.